The Russian George the Victorious (Russian: монета Георгий Победоносец) coins are bullion coins issued in gold and silver by the Central Bank of Russia. The gold coins have a face value of 50 rubles and have been minted since 2006. The silver coins are Russia's first bullion coins in that metal; they have a face value of 3 rubles and have been minted since 2009. Gold George the Victorious coins were first issued on February 1, 2006. 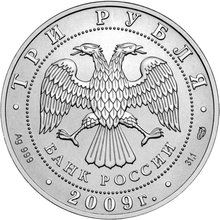 The obverse features the emblem of the Central Bank of Russia—a double-headed eagle with wings down—and is inscribed with "БАНК РОССИИ" (Bank of Russia), "ПЯТЬДЕСЯТ РУБЛЕЙ" (Fifty rubles), indications of the precious metal content and its fineness, and the year of issue followed by the mint mark. The reverse features an image of Saint George and the Dragon. The coin was designed and sculpted by A. V. Baklanov and minted at Saint Petersburg and Moscow. On the first of August 2012 the Central Bank of the Russian Federation issued two special coins under "Saint George the Victorious" title. One coin has denomination "50 rubles" minted in 99.9% purity, and contains not less than 7.78 gram of fine gold. Unlike traditional 50 rubles Saint George the Victorious, the coin is minted in proof quality. Another coin has "100 rubles" denomination, features 99.9% purity, contains not less than 15.55 gram of fine gold. The coin has the same design like 50 rubles Saint George the Victorious coins (except denomination on the obverse) but greater diameter and thickness. There are 240 corrugations on the edge of the coin (134 corrugations are on the edge of 50 rubles coins). The coin is also minted in proof quality. 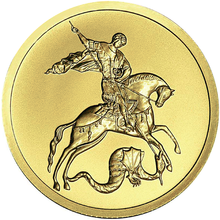 Higher prices (10-20% over uncirculated competitors of the same gold content), low mintages (10 thousand pieces of each denomination were issued) and a special care of proof coin handling turn Gold Saint George the Victorious in proof quality coins into numismatic items (commemorative coins) rather than means of a straightforward investment in gold coins. Silver George the Victorious coins were first issued on January 11, 2009. 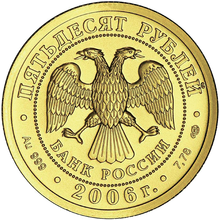 The obverse features the emblem of the Central Bank of Russia—a double-headed eagle with wings down—and is inscribed with "БАНК РОССИИ" (Bank of Russia), "ТРИ РУБЛЯ" (Three rubles), indications of the precious metal content and its fineness, and the year of issue followed by the mint mark. 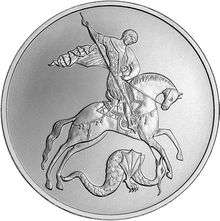 The reverse features an image of Saint George and the Dragon. The coin was designed and sculpted by A. V. Baklanov and minted at Saint Petersburg. ^ "St. George the Victorious". Bank of Russia. Archived from the original on March 4, 2010. Retrieved April 5, 2010. ^ "Saint George the Victorious (proof, 50 Rub)". Bank of Russia. Archived from the original on October 28, 2012. Retrieved August 1, 2012. ^ "Saint George the Victorious (proof, 100 Rub)". Bank of Russia. Archived from the original on October 28, 2012. Retrieved August 1, 2012. ^ "Saint George the Victorious (silver)". Bank of Russia. Archived from the original on August 17, 2009. Retrieved April 5, 2010.